Welcome to the world of Wordle. Until today I had never visited the site although I had a knowledge of ‘word clouds’. I must say a big thank you here to my online friend and fellow blogger Chloe for pointing me in the direction of this incredible tool. My romantic novel ‘Ten Days’ is now at a point where a lot depends on; feedback from my five sample readers, the response from my proof-reader and the results of the person tackling the design for the front cover. Personally I’m in the process of reading a hard copy of the manuscript, word by word and line by line. I was aware of the overuse of some words but not others. 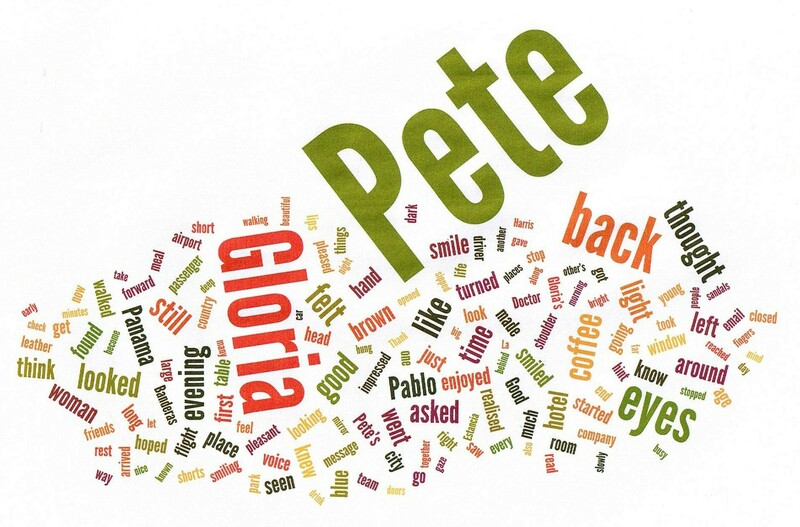 It’s a romantic novel featuring two main characters; Pete and Gloria, so you might well expect them to appear a lot. In my Wordle experiment, I found that to be the case so I was pleased. After subjecting the entire novel to the filter effect of the Wordle system it seems that I rather like the word ‘looked’. No, that’s not quite correct. I’m lazy where the word ‘looked’ is concerned, so I should now be seeking to alter it on many occasions to a word of similar meaning … and I’ve ‘looked’ and there are several out there. I would recommend Wordle to all writers. Progress on the novel? Yes, I think I can say with confidence that I’ve made some. I’ve got the main task done, which is reaching the end of the third draft. My read-through will be a tidy-up and then my proof-reader will highlight issues for me. I have the opinions of one of my sample readers already and I’m confident in my cover designer’s ability. I’ve decided to take the self-publishing route through Smashwords to produce an e-book. I’ve read all three books produced by the man behind Smashwords – Mr. Mark Coker. Once I’ve managed to work my way through that system I’ll tackle the Amazon Kindle method. One step at a time eh! My aim is now to get the book out there for early-mid November. I have plenty of work to do yet and I still have to depend to a great extent on other people. One last thing to do is a bit of self-marketing. My website is now up and running, ‘Tom Benson – Creative Writer and Artist’. If you’ve checked in here, please feel free to check in there too, browse and leave a comment in the Guestbook. I’m constantly adding to my art portfolio on the site so it’s not just writing in there.